Slide-Lok continues to set the standard for support of its North American dealer network by providing its dealers with over $130,000 of plywood garage cabinet inventory to be used as giveaways at home shows and expos throughout North America during the first quarter of 2007. Slide-Lok is making this offer exclusively through its dealer network further demonstrating Slide-Lok’s commitment to their dealer’s successes. By giving away over $130,000 worth of garage cabinet inventory to the public through their North American dealer network, Slide-Lok has created a resonating buzz that is sure to put its competition on its heels. “We want to start 2007 off with a bang” explains Brian Strayer, Slide-Lok’s president. 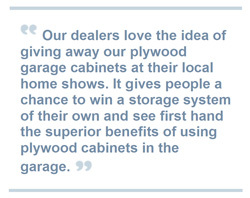 “Our dealers love the idea of giving away our plywood garage cabinets at their local home shows. It gives people a chance to win a storage system of their own and see first hand the superior benefits of using plywood cabinets in the garage.” Slide-Lok participates in hundreds of home shows and expos across North America and is proud of its extensive dealer participation, maintaining Slide-Lok’s leadership position in the rapidly growing garage storage market. 800-835-1759 or visit them on the web at www.slide-lokofthebayarea.com.